Thousands of help wanted signs in storefront windows across Canada can now be found online by jobseekers, thanks to a crowdsourcing smartphone app. Indeed.com has officially launched its Job Spotter mobile app in Canada. The free Android and iOS app has been used to upload a total of 2.4 million job postings in the U.S., U.K. and Australia since it debuted in January 2016. More than 300,000 Canadian job postings have been uploaded with the app since its soft launch in Canada a year ago. Job Spotter works on the premise that despite today’s digital dominance, many jobs are still only posted offline – on handwritten signs, chalkboard scribbles and bulletin board Post-It notes. By using the Job Spotter app, millions of people walking around with smartphones can snap photos of these offline job postings and bring them into the online employment market, where more jobseekers can see them. An ad created with the Job Spotter app includes photos of a help wanted sign, the business address and directions to get there. “We want to aggregate every single job that exists in the world but we know many don’t make it online. How do we find these jobs? What if we allowed people to go in and take photos of jobs that would never make it online? 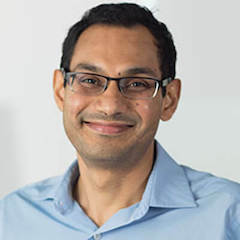 So many (jobs) would have never seen the light of day” without the app, said Raj Mukherjee, global senior VP of product at job search website Indeed.com. 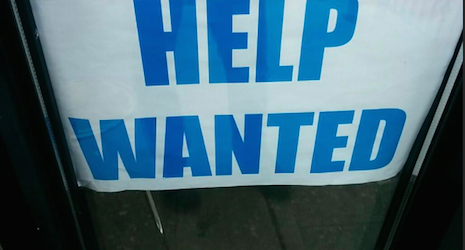 Canadian users download the app to their phone, snap photos of help wanted signs, then upload them to Indeed.com via the app. All photos must be approved by Indeed.com, however, before they appear in the general help wanted listings of the website. “We review the picture you sent us, validate it’s a picture we can convert to a job posting and then we let you know it has been approved,” Mukherjee said. Staff from Indeed.com approve uploaded images to make sure they’re actually help wanted signs (rather than cat pictures, for example), and also to disqualify signs that have already been submitted by previous users. “If we find there are hundreds of photos of the same posting, obviously the person submitting it will not get it approved. And you can’t take the same picture of the same posting every day,” Mukherjee said. The average time it takes to get a picture approved is about one hour. Once an image is approved, optical character recognition (OCR) software extracts text from the photo and converts the words into a job listing on Indeed.com. Each job posting created on Indeed.com through Job Spotter includes the original photo of the help wanted sign, the address of the business and Google Map directions to get there. Although job postings are not set to automatically expire from Indeed.com after a certain time period, each one features a link encouraging users to report whether the job has already been filled or taken down. In addition, Mukherjee said listings are programmed to fall out of the top search results as they age and garner fewer clicks. Besides helping Canadians find jobs, Job Spotter can also help them buy stuff online. To motivate people to upload photos with the app, Indeed.com rewards Amazon gift card points for each approved picture that gets turned into an Indeed.com job listing. Pictures of help wanted signs posted by large chains in big cities are worth fewer points, while signs put up by independent or small businesses in smaller towns are worth the most points. The points (which cannot be converted into cash) can add up to surprisingly substantial sums. In September, British freelance journalist Emma Lunn described in the Mirror newspaper how she amassed points worth £700 (CDN$1,172) in six months by posting photos of help wanted signs on Job Spotter. Indeed.com says an American who submitted 14,096 photos worth USD$6,500 in points holds the record for the highest total points value so far. The app itself has demonstrated the value of Indeed University, an annual program Indeed runs out of its Austin, TX headquarters. Each summer, Indeed recruits a group of top grads from universities around the world, hires them as fulltime staff and gives them 12 weeks to work on HR-related technology projects of their choice. New Indeed hires, fresh from university, brainstorming an idea at the inaugural Indeed University program in 2015.